Immunoglobulin A (IgA) nephropathy is a chronic glomerulonephritis with excessive glomerular deposition of IgA1, C3 and C5b-9, which may lead to renal failure. 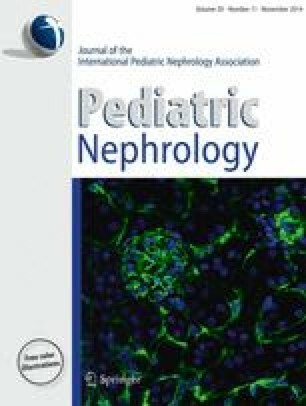 We describe the clinical course of an adolescent with rapidly progressive disease leading to renal failure in spite of immunosuppressive treatment. Due to refractory disease the patient was treated with eculizumab (anti-C5) for 3 months in an attempt to rescue renal function. Treatment led to clinical improvement with stabilization of the glomerular filtration rate and reduced proteinuria. Discontinuation of treatment led to a rapid deterioration of renal function. This was followed by a single dose of eculizumab, which again reduced creatinine levels temporarily. Early initiation of eculizumab therapy in patients with progressive IgA nephropathy may have a beneficial effect by blocking complement-mediated renal inflammation. The online version of this article (doi: 10.1007/s00467-014-2863-y) contains supplementary material, which is available to authorized users. This study was supported by the Swedish Research Council (Grant K2013-64X-14008), The Torsten Söderberg Foundation, Crown Princess Lovisa’s Society for Child Care, The Konung Gustaf V:s 80-årsfond (all to DK). MJ is supported by the Marianne & Marcus Wallenberg Foundation, The Swedish Kidney Disease Association and Malmö University Hospital Research Funds. Diana Karpman was the national coordinator in Sweden of the international trial of eculizumab (Alexion Pharmaceuticals) during 2009–2010. Lisa Sartz is the current national coordinator of the Alexion aHUS registry in Sweden.